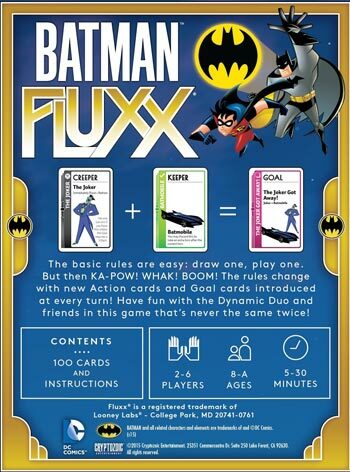 Home Games Batman Fluxx Review – A Collection Worthy Card Game? I love visiting my local gaming shop. My eyes are always bigger than my wallet when it comes to card games and board games. One series that caught my eye recently was the “Fluxx”. Fluxx game boxes are relatively small – about the size a Pokemon Starter Deck (4.5″ x 3.5″ x 1″) – and the boxes have everything 2 to 6 players need to play. 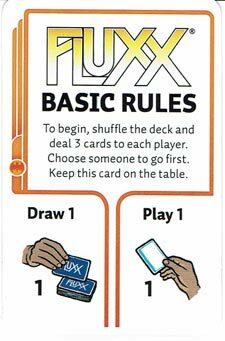 For those not familiar with Fluxx, there are a plethora of Fluxx versions to choose from: Fluxx; Doctor Who Fluxx; Monty Python Fluxx; Drinking Fluxx; Stoner Fluxx; Zombie Fluxx; Oz Flux; Math Fluxx; Chemistry Fluxx; Anatomy Fluxx; Cartoon Network Fluxx; etc. etc. etc. 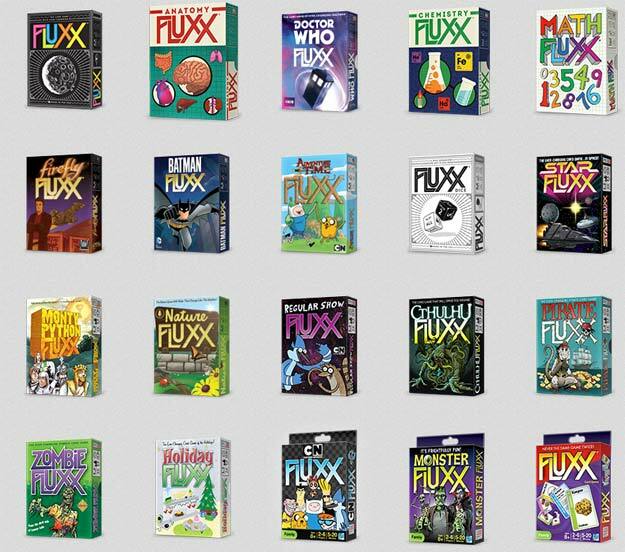 There are about 3 dozen variants of Fluxx, and I saw many of them sitting on the shelf staring at me at my Game Shop. With so many Fluxx games out there, I wanted to know what the fluxx was going on. I decided to dive in and pick up a copy for my gaming group to test it out. 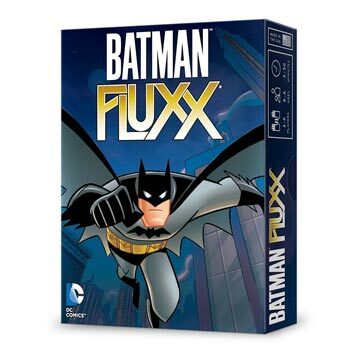 For my first foray into the Fluxx gaming world, I opted to purchase “Batman Fluxx”. I liked the artwork which was straight out of the Batman: The Animated Series. I’m also into the superhero genre, so it seemed like a great place to start. As I stated above, the small box contains everything you need for 2-6 players to play a game of Fluxx. The box recommends ages 8 & up. And the box says a game will take anywhere from 5-30 minutes. Inside the box are 100 cards and instructions. The definition of Flux fits this game very well, as the rules of the game and goals for winning the game are changing all the time. Setup is simple. Deal everyone 3 cards face down. And put the Basic Rules Card in play. The Basic Rules are: Draw 1 card and Play 1 card. That’s it! There’s not even a goal for how to win the game yet! As the game goes by, players will play cards that change the rules of the game. New Rules: If you are the first player, you might play a New Rule card that says: “Draw 4”. This replaces the basic rule of drawing 1 card, and now everyone will draw 4 cards. Goals: The game begins with no goal to win. Once a Goal card is played, that goal applies to everyone, unless someone else replaces it with another goal card. Keeper: You play Keepers in front of you. Keepers can help you win the game if they meet the current goal. 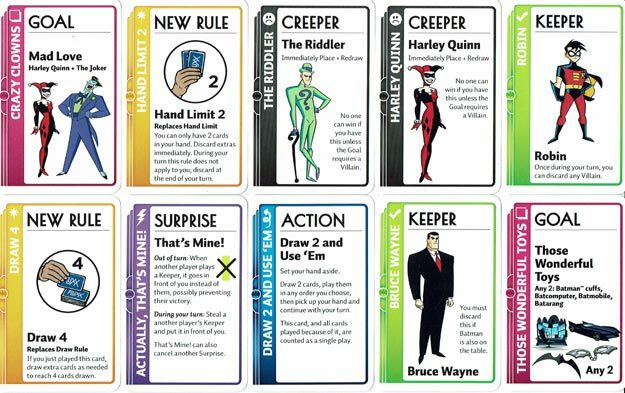 In Batman Fluxx, these are the Good Guys in the animated series. Creeper: Batman’s villains. Must be played in front of you as soon as you draw them. They are usually undesirable, but some goals allow the bad guys to win! Surprise: A card that usually lets you stop an action or steal a card even if it’s not your turn. The game ends when someone meets the conditions of the current goal. That player wins instantly no matter what! If the Goal has the good guys winning, no villains/creepers can be on the table. You must first clean up Gotham City! The game is simple to teach and easy to learn. You start off with that simple rule of Draw one card, play one card. That’s very much Uno-ish. All the Changes. It can be fun to have continuous change. The goals change, your hand size changes, the amount of cards you draw changes, etc. This can make every game you play different. Portability. This is an easy game to take on trips. It’s small enough to slide into a backpack pocket, and easy enough to teach friends and relatives once you get there. Plays 2 to 6 players. Cost seems fair. I picked up this game for $15. Check the current price on Amazon. Luck! The element of luck is very prevalent in this game. Yes, there can be some strategy, but your strategy is never a long term strategy. If you’re working on a strategy to win with the current Goal, there’s a likelihood that the goal card will change before your next turn, or that someone will steal your Hero, or kill your Creeper. Games can be too short. Someone might get lucky and have the winning goal cards very early in the session. Games can take too long. Someone might not get the winning combo for an hour. 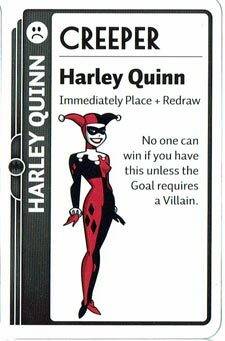 I enjoy Batman Fluxx! Yes, there’s a large element of luck to it, but if you know that going in, you can still enjoy yourself. The game still requires you to “try” to strategize yourself a win and TCG gamers should be good at that. Usually your opponents are doing the same though and are working against you. I like that Batman Fluxx is relatively easy to teach. I can easily see myself taking this on trips to see relatives and talking my nieces and nephews into playing a few rounds of Fluxx. Batman Fluxx has over 100 reviews on Amazon, and gets 4-1/2 stars, so a majority of people like it. The regular version of Fluxx, Fluxx 5.0, has nearly 300 reviews on Amazon with a 4.5 star approval rating as well. With so many versions of Fluxx available, you’re sure to find one that appeals to your interests.